Our Classic #Oktoberfest #Lager #Craft #Refill brews 2 gallons (16 pints) of delicious craft #beer. Also referred to as Märzenbier, this malty, deep amber-colored beer features a smooth body, toffee-like malt richness, and a full, biscuit like bouquet. Sample the celebrated beer of Munich’s world famous Oktoberfest. Mr. #Beer brewing extracts are all natural, GMO free, have no added sugar and are made from the highest quality barley and hops at Coopers Brewery’s state-of-the-art facility using a processes to retain all of the natural flavors, colors, and characteristics that are vital in brewing high-quality beer. Brewing extracts cut multiple time, equipment, space and cost-intensive steps out of the homebrew process – while producing a consistently great-tasting, premium craft beer. The proprietary brewing yeast that is included with every Mr. Beer brewing extract is designed specifically to perform well at a wide variety of temperatures, allowing brewers to rest easy brewing their beer at any time of year. The Mr. Beer Oktoberfest Lager Refill is a malty, deep amber colored beer that features a smooth body, toffee-like malt richness and a full biscuit like bouquet. This lager represents the style of the celebrated beer of Munich’s world famous Oktoberfest. Included with this refill is 1 packet of Dry Ale Yeast and 1 packet of No-Rinse Cleanser. All you need is water, and your Mr. Beer kit to get brewing another batch of top quality all malt beer. I like this one and if you like Octoberfest you shouldn’t be disappointed. This is my second brew with 2 weeks fermenting, 2 weeks carbonating and 2 weeks in the fridge and I couldn’t be happier with what I poured. I think it tastes great (like that toffee flavor) and the head is bold, lasts and doesn’t evaporate in seconds like most beers. If my other brews come out like this one, and my first brew of the Irish Stout, I’ll never be in the beer aisles of a food store again. I purchased this directly from Mr. Beer because the price was lower and I was ordering enough other items (sanitizer, bottles and several refill kits) that made their flat rate shipping worthwhile… they also offer some really good custom kits that crank out some higher alcohol levels if that’s of interest (this one is good for about 3.7% and that’s low for a beer but I wanted taste and I got it… I don’t need to get drunk on my first mug of it. Someone commented on the booster pack but it’s not needed with this item unless you want to increase the alcoholic content. I read a lot of negative comments out the Mr. Beer system and the refill kits and I can’t say I’ve had anything but a positive experience. Sure, the keg is plastic but so is most of my Ford Expedition. Taste is too relative to argue with but I’ve been drinking beer for about 50 years and have it fresh brewed; visited pubs while I traveled many countries in Europe where they had some idea what was a good beer; and lived in Milwaukee in the 60’s when a brewery tour was what you did on weekends. I think, so far, the Mr. Beer lineup has been pretty satisfying. I live about 40 miles from the nearest city and every store sells the same lineup of beer. When I lived in NY, NJ & PA there was selection, it was fresh and the prices were reasonable. Now that the case has been replaced with the 12-pack it’s more per-bottle than it’s really worth. I like Micro-Brews and the best one available here is Deschutes from Oregon. They had a decent Porter, IPA and an Obsidian but they all taste worse than before and now average about 14 bucks a 12-pack. Blue Moon and Fat Tire were also pretty good but now they’re owned by the big boys and again seem to have lost the taste… plus they all gave me the poops the next day. Finally, I tried the Mr. Beer line and it had nothing to do with cost and after my first 3 brews I’ll never buy bottled beers again from the local markets. However, if cost is a concern then ignore those comments about this costing about what the store bards run. Seems some folks can’t do the math, are prone to not telling the truth or are just plain confused. This system brews 2-gallons of beer and that’s 256-ounces which equals 21.3 12-ounce bottles. At about 17 bucks a can I get nearly a full case of beer for what I was paying for one 12-pack. You can buy directly from Mr. Beer and with their flat rate shipping they offer a lot more variety if you want to stock up on bottles also. I have purchased a few of the punched-up kits (Deluxe refills) that give you a higher alcoholic content and will brew them soon. They also have recipes if you want to dabble in your brews. I go with 2 weeks fermenting, 2 weeks carbonating and 2 weeks in the fridge before drinking. The beers are made in Australia by Coopers Brewery Ltd. And distributed through Mr. Beer… which they appear to also own. This is a baby step process and seems almost foolproof but I can’t deal with what’s on the shelves anymore. I expect to move on to using my own ingredients, which you can also do with these kits, and was pleased to find a huge vine growing in my yard that I have fought off unsuccessfully for years is actually hops. I’m already thinking ahead to summer. I agree with other reviewers that Mr. Beer’s claim that you’ll be downing it after only 2 weeks is probably not what you should expect if a better beer can be had by waiting a little longer. I posted a pic of what my first brew looks like after 2 weeks fermenting, 2 weeks carbonating and 1 week in the fridge (should have been 2 weeks but I’m impatient) and I couldn’t be happier with what I poured. I think it tastes great (similar to a Guinness Stout) and the head is bold and lasts and doesn’t evaporate in seconds like most bottled beers. 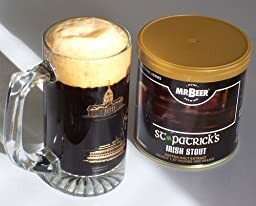 The beer I just made is the St. Patrick’s Irish Stout and if my other brews come out like this one I’ll never be in the beer aisles of a food store again. If you don’t like the strong taste of a stout then this beer probably isn’t what you want and perhaps a dark or a Porter may be better. I purchased this on from Amazon for 19 bucks… but i also purchased one directly from Mr. Beer because the price was lower and I was ordering enough other items (sanitizer, bottles and several refill kits) that made their flat rate shipping worthwhile… they also offer some really good custom kits that crank out some higher alcohol levels if that’s of interest (this one is good for about 3.7% and that’s low for a beer but I wanted taste and I got it… I don’t need to get drunk on my first mug of it. I am trying something a little new with this video. Hope it is helpful. A good beer to enjoy on a spring or summer afternoon while baking in the sun or with a heavy BBQ. Compared to the Bavarian Weissbier I made recently, this has a fruitier taste (maybe from the honey I added) and brings out a fuller range of tastes. It is a little more carbonated and bubbly than you get with a wheat beer, too. The overall taste is decent but I still prefer Central American pilsners for a hot day. I need to try out the Aztec Mexican refill. I fermented for 10 days, bottled for 14 days, and then conditioned it in the fridge for a week for one set and two weeks for another couple. The longer conditioning seemed to bring out a sweeter taste. In terms of ingredients while brewing, I only added in 1.5 cups of white sugar and Trader Joe’s 100% Desert mesquite honey. I haven’t measured but my guess is a 5% ABV based on typical contributions from the sugar and honey. Lightly colored, clean, fresh palate, well balanced with subtle hop notes and a crisp finish, this is a classic easy drinking Canadian style beer.